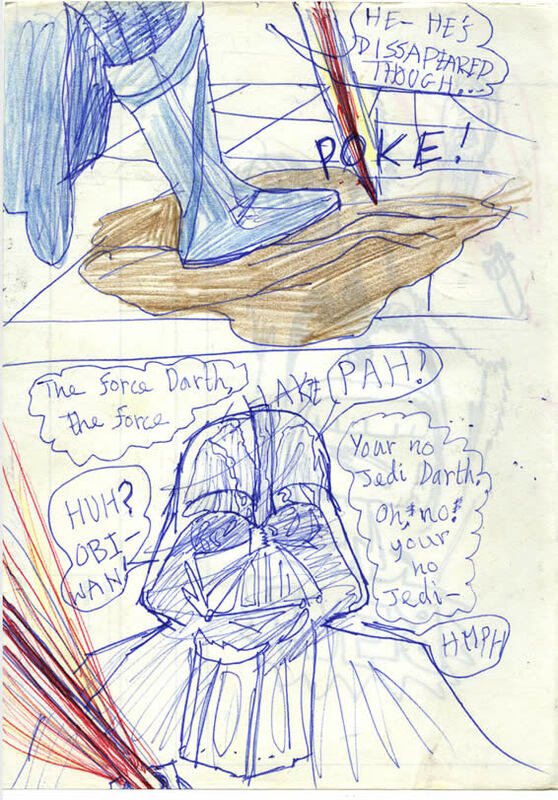 1978 | age 9/10 Ben’s disappeared, and Darth is baffled—in the Beano comic sort of way, shaking his head, in a double-take, trying to grasp what’s happened. This page is gas. From when I was 9 or 10—or 11? Zillions of fans—including Simon Pegg—are incensed about the latest BluRay release of ‘Star Wars’. (some of this was written way back) One focus of rage and frustration is that Darth now shouts “Noooooo” during Return of the Jedi. It wasn’t enough that fans hated him doing it in the subsequently made Prequel. No, unfortunately, our George likes this sort of re-jigging: “It rhymes. Kinda like poetry”. But, sometimes it’s better to leave characters in quiet contemplation. Or for them to only express their feelings physically. This is a visual medium after all—not Radio. In today’s naíve page however, young me is guilty too! 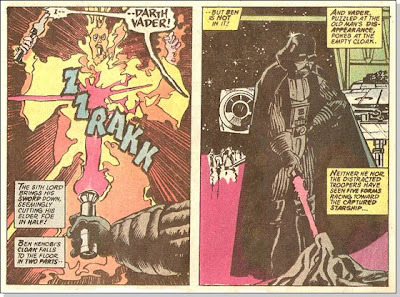 You get extra insight into what Darth was thinking when he struck Ben down. He’s perplexed and even prods Ben’s cloak with his saber. Didn’t know you could do that, did you? It’s reminiscent of that other oddity: « blood dripping off Ben’s Saber in the Cantina. I do feel a bit embarrassed making this page public, to be honest. It makes me both smile—and wince! Ben’s tone mocks even from beyond the grave. Darth SHAKES his head, in a double-take or just trying to snap out of his confusion. I swear, I’m imagining one of those old Hannah-Barbera cartoon sound-effects as I watch him. But what really happened to Ben? It’s funny. When I was a kid, I saw Ben disappear when he was struck down and I never felt the need to understand why. I just accepted it as some amazing supernatural phenomenon. It didn’t all have to be explained to me. It was almost like religious faith I suppose—with all of its mysteries. “He became one with the force” Yep, sounds good. Or like the stuff you’d see on Arthur C. Clarke’s Mysterious World, TV series, which was exciting exactly because it was mysterious and unexplained. Now, I think I can see that he changed from one form of energy—or matter to another. And it’s likely that the expanded universe and the PT have explained it all ‘scientifically’. After all, having the power of the force within you is now all about Mitochondrial DNA-like Midichlorians—thanks to the Prequels. Which is disappointing really. I preferred the excitingly supernatural and vague version. This is escapism after all. And ‘Star Wars’ left a lot to the imagination. George just dropped us in there, intentionally, with as little explanation as possible. 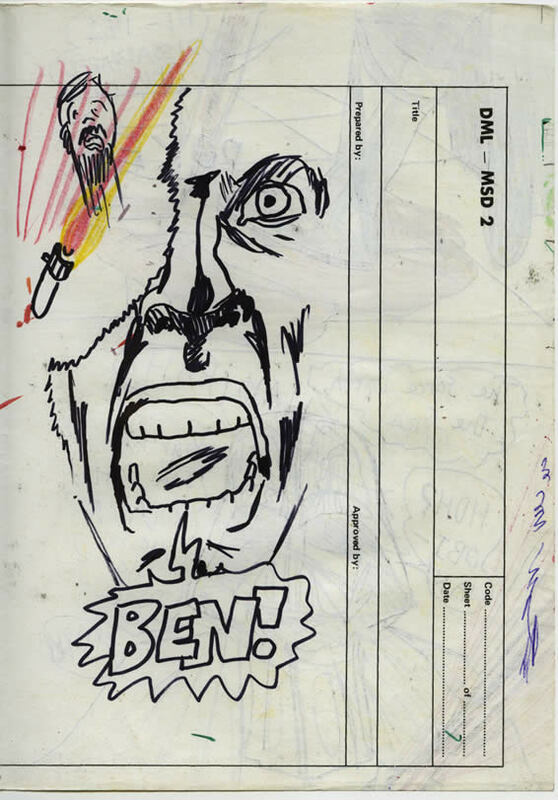 So, in the pictures on the back of this page you’ll be surprised by the daft, insensitive image of Ben being decapitated—or something (the top-left). Don’t ask me why it’s like that! I mean, Ben just disappeared, didn’t he? You knew that—I knew that. This version is silly, comical and kind of makes light of something gruesome. It also just makes it look like his head was chopped off like anyone else’s would have been. Did his head vanish in mid-air, on the way down, or when it hit the floor? or straight after it hit the floor? Who knows. I’ll tell you what though, I didn’t have the monopoly on silly: check out Marvel’s version of it, below. It’s even nuttier! You mean this one John? Funny, Dan, you found the exact same one that I did this morning! Quicker than scanning from my old printed copies. I wonder what else NOOOOOOOOOOoooo …. will be added to? When the Scout Walker gets crushed by 2 Ewok logs will it roar – robotically NOOOoooo… What about when one of the Ewoks gets killed? Will George “make it rhyme” when he gives Anakin a twin sister, and Threepio a grafted-on human hand, and Ben an Evil father and…. I actually LOVE the idea of Ben trash talking him from the netherworld – awesome! Welcome back Neil. I could only assume that you were off becoming a famous filmmaker or something. C’mon Gatto – he was raptured. Wow, that comic page (the Marvel) one is kinda freaky! I think I like the movie version better, althoguh both of yours crack me up! Yes, if you want ‘daftness’ – Marvel and SWa9 certainly fit the bill. Apparently there’s also a Japanese Manga comic adaptation – which I wouldn’t be able to stomach – but what I’ve seen is pretty wacky too.